This is our Facebook Page growth and engagement study for the month of March 2017. We look at the performance of 5,000 Facebook pages to identify the trends on the platform. This helps you understand what the standards are on Facebook in terms of page likes growth, post reach, content engagement, post format performance, and the use of Facebook advertising to boost the organic content. This allows you to compare your own page performance against the standards. Is your page growing faster or slower compared to the average? How about the reach you’re getting? And what post format do you use and what performance do you get from it compared to what is expected on the platform? Answers to all these and many other questions help you better understand the results of your efforts and can guide your way to improving your Facebook strategy and your content activities. Do you want an even deeper comparison to the standards on Instagram, Twitter and Facebook? Take a free Locowise trial. Let’s take a look at the numbers for March. Page likes growth was at 0.17% in March. This is a 30.77% increase compared to the 0.13% page likes growth in February. It’s also the highest growth we’ve seen since November 2016. Post reach was at 12.57% of the total audience and it’s a 1.62% increase compared to the last month. This is also the highest reach we’ve seen since we started doing our studies in May 2015. 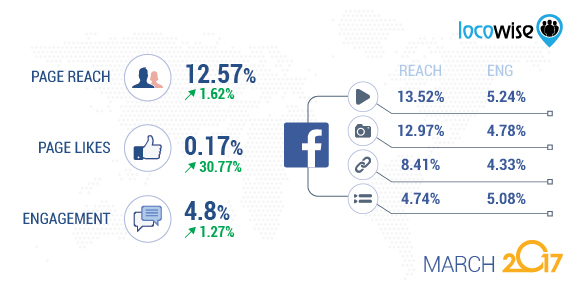 We’ve seen the average post reach increase by 40.92% since January this year and it makes Facebook a much more attractive proposition for many brands who rely on organic results. Videos reached 13.52% of the audience, photos 12.97%, links 8.41% and status updates reached only 4.74%. Post engagement rate was at 4.8% of the people reached. This is 1.27% higher than the ER in February. Engagement rate has increased by 11.11% since the record-low engagement we saw in January this year. Videos engaged 5.24% of the people reached, status updates 5.08%, photos 4.78% and links only 4.33%. 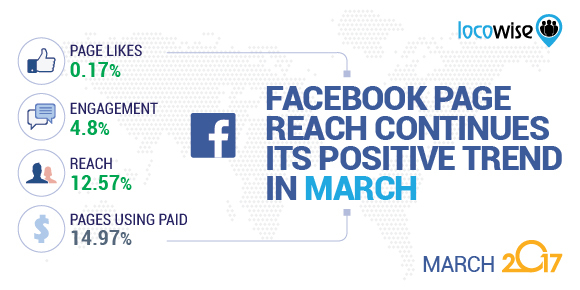 14.97% of all pages used Facebook advertising in March paying for 33.37% of their total page reach. Let’s now take a look at some of the most interesting new features introduced and other product developments during the month of March. Facebook is continuing its efforts to get more of the users to watch longer videos. The company is testing a new “continue watching” feature on top of the mobile app and in the desktop news feed too. The feature lists videos you started watching but haven’t finished. It’s now also possible for everyone (including groups and pages) to broadcast live from the desktop. Go to this page and click on the “Create Live Stream” to start your broadcast. The stream gets shared to your Facebook audience and you can also embed the HTML code on your website to let your visitors watch the live stream directly on your website. Pages will now also be able to add “donate” buttons to their live streams. 360-degree live streaming is now open to everyone as well. The company has also launched its first dedicated virtual reality app Facebook 360 for Gear VR. Facebook is also launching a new ad type called Collection. It allows marketers to add product images to a video ad in news feeds. When the image is clicked, the user gets to see the product catalogue on Facebook and can from there click on to buy the product on the brand’s website. In order to track collections better, Facebook is working on developing better outbound click metrics to track users that click on links on Facebook and Instagram and visit the external websites of the advertisers.